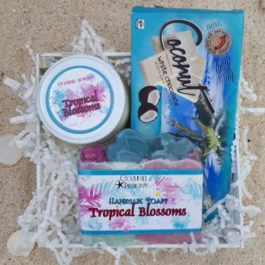 Red wine, chocolate, and the aroma of sensual jungle fruit fill this deluxe gift-wrapped basket. 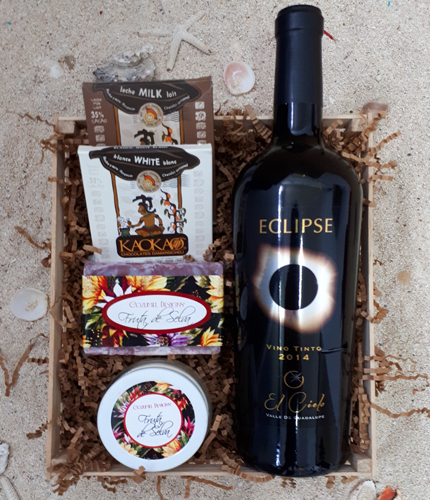 A 5 oz bar of Fruta de Selva handmade soap, a 4 oz Fruta de Selva soy candle, and a 30 gr bar of both Dark Chocolate and Milk Chocolate from Kaokao Chocolates are accompanied by a 750 ml bottle of Eclipse Wine from El Cielo Winery. Eclipse is a mixture of different red grapes aged in French oak barrels to add a smoke-like note to this rich red wine. 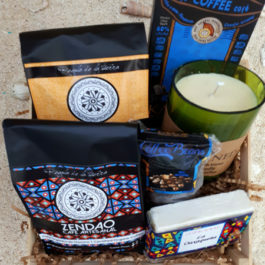 A gift-wrapped basket with 8 oz bags of both our Zendao Cafè Artesanal coffees: Chiapas, a medium roast mixture from Chiapas, Oaxaca, and Veracruz, and our Organic coffee from Oaxaca. 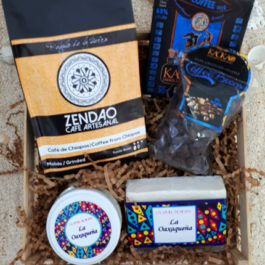 Also included is a is a 100 gr bar of Chocolate with Coffee and a package of Chocolate covered Coffee Beans from Kaokao Chocolates, a 5 oz bar of La Oaxaqueña deodorizing handmade coffee soap, as well as an 11 oz coffee-scented Rewind candle in a recycled-repurposed wine bottle, perfect for coffee lovers. The basics for a sunny day at the beach. 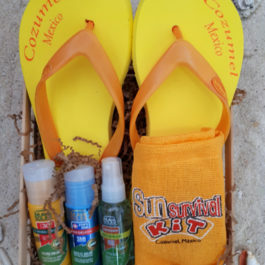 Women’s Flip Flops and a burlap Sun Survival Kit filled with 75 ml Sun Block, 75 ml After Sun Cream, and 60 ml Insect Spray. All the Maya Solar products included are hypoallergenic and biodegradable – safe for the flora and fauna in our Cozumel environment.